Trying to find depth finders online is an herculean task! This is because this particular device is now commonly merged with fish finders. However, I am well aware that not everyone looking for a depth finder is trying to find fish. Most people, kayakers included, simply want to map out the various depths of a particular body of water. This helps to prevent grounding your vessel in overly shallow waters. In my search for the best depth finder, I looked for certain qualities. This included the ease involved in using or attaching the device to the kayak as well as the accuracy of the depth finder. 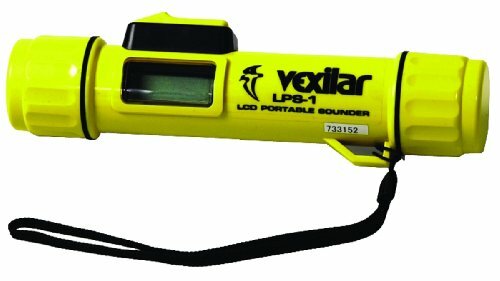 The Vexilar Inc. LPS-1 depth finder is an excellent addition to any kayaking, fishing, or diving expedition. This is a handheld depth finder which comes equipped with a 200 KHz built-in transducer. This allows the LPS-1 to be able to read depths between 1.8 to 200 feet. You can choose to use it while in a vessel. In this case, you simply need to place the transducer part into the water and power up the device. However, you can also use these devices while you are in the water. It is waterproof up to 150 feet so you can use it while snorkeling and scuba diving as well. It even works well in environments required for ice fishing. Perhaps the most notable feature of this device is that it floats. Even if you happen to drop it in the water, it will simply bob on the surface, making it easy for you to recover it. The neon yellow of the LPS-1 means that you will be able to see it clearly as well. Although the display is a little on the small side, you can still view the readings without an issue. Since it is a handheld version, this depth finder relies on 9V batteries. The display automatically shuts off every ten seconds, so that you are able to conserve the battery. The screen is equipped with a backlit display so that you can use the LPS-1 even during the night. The HawkEye DepthTrax 1B is certainly a favorite among consumers. What’s nice about this depth finder is that you get to choose how you want to set it up. You can decide between the transom mount feature or glue the finder in the hull. This means that regardless of the way that your vessel is equipped or designed, the DepthTrax 1B is going to be a good match. 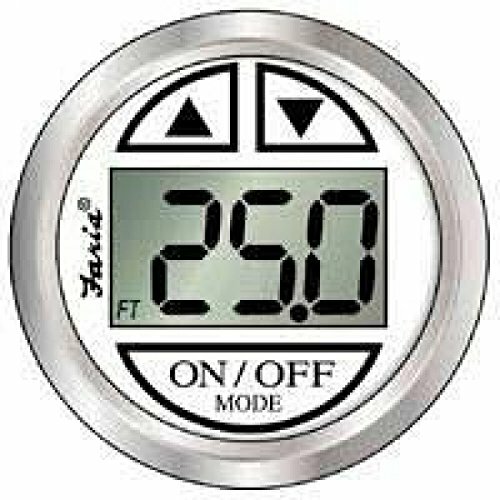 This finder can offer up readings between 2.5 to 200 feet and also provides readings in meters as well. Best of all, it doesn’t matter how fast you are travelling, you can still rely on this finder to provide accurate readings. It can do so with speeds up to 63 miles per hour. Unlike modern fish finders, there is also no delay in the readings. The adaptive software programming works to reduce the false signals or readings that the depth finder will receive. The DpethTrax 1B comes equipped with a three-stage depth alarm. You will be able to tell whether you are venturing into waters that are either dangerously low or treacherously deep with plenty of time to spare. The connectors for this depth finder are the plug-and-play variety. This means that setup is an absolute breeze. Add to that, they are marine grade which allows them to be incredibly durable, even in saltwater conditions. The backlit display is 1.65 inches long, making it very easy for you to monitor the readings. To sweeten the deal even further, the DepthTrax 1B comes with a two-year warranty, which provides coverage for most instances. 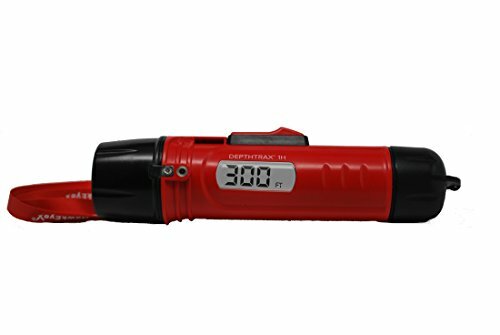 If you are looking for a handheld depth finder that is just a little bit more powerful, then the Speedtech Depthmate portable sounder is a good choice. The built-in transducer produces a 400 KHz signal at a six-degree angle. The result of this is that the Depthmate is able to measure distances between 2 feet and 260 feet. Even through a hull or ice, the readings are quite accurate, up to the nearest tenth. You can choose to receive readings in either meters or feet. This portable device is also waterproof up to 160 feet. Therefore, it can be used in the water if you wish to dive or go snorkeling. The Depthmate uses 9V batteries to power it. 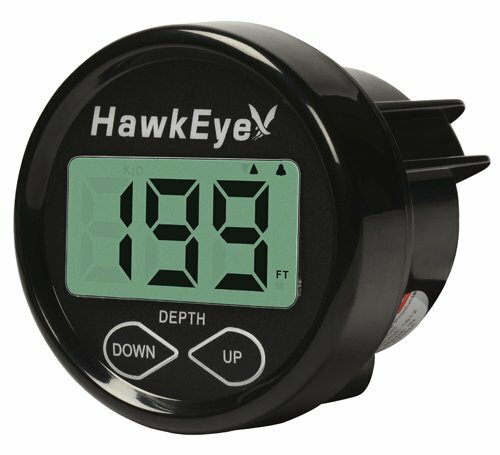 This depth finder has a power saving feature where the displays go off every ten seconds after a reading is displayed. This is so that no additional power is used up unnecessarily. Due to this, you should be able to get up to 500 readings with just one battery. To use the Depthmate, you simply have to place the transducer part in the water and power it on. The display is backlit so it will function well in most lighting conditions. It should be noted that this depth finder only works in the water. It cannot be used to measure depth or distance while in the air. This device weighs just 8 ounces, which means that it is light enough to hold for hours on end without getting tired. 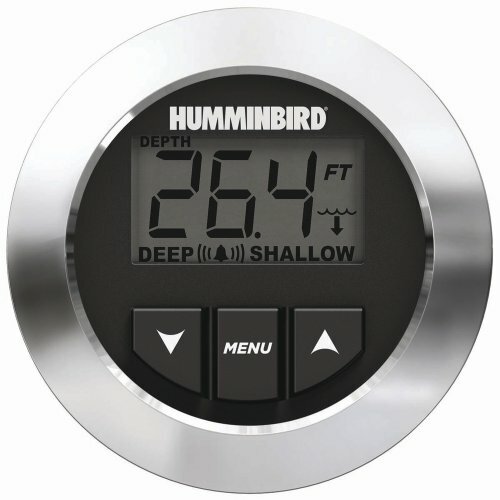 The Humminbird HDR650 is one of the most straightforward depth finders on the market. This makes it simple to use and even easier to read. This device works by sending out a sound wave signal. The distance is determined by the amount of time that it takes for the wave to reflect back from the ground or an object. This signal continues to be updated as you travel across the water, it even transmits when the vessel is moving at high speed. The transducer produces 200 KHz, making the HDR650 capable of reading depths up to 600 feet. You can view the depth as meters, feet, or fathoms. Now, the HDR650 does come fully equipped with everything that you will need to set it up. That being said, it can take a while for you to get everything arranged properly. You can also set alarms to alert you either when you are in shallow water or deep water. All of the settings that you organize are automatically saved so that you can continue to rely on them without having to reset the device. The LCD display is large, making the readings visible at all times, even when the lighting is especially bright or low. The buttons are also large, with simple mechanisms so you can quickly change the settings on the fly. The display is water resistant and as a whole, this device is quite durable. You can expect it to last you for a long time, even with constant use. 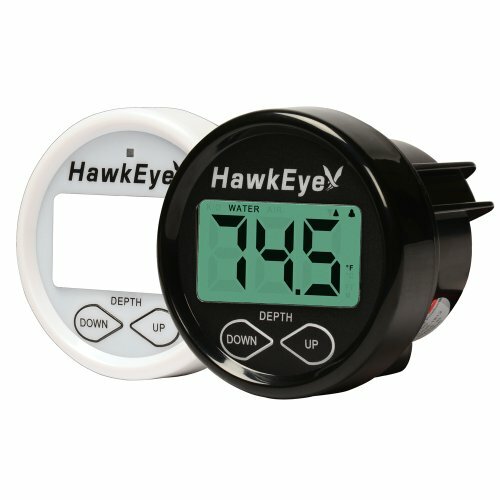 If you’re not one for DIY installation projects, then you are going to really enjoy using the HawkEye DT1H depth finder. It is simply a matter of holding the transducer portion of the DT1H in the water and activating it. The device then transmits sonar signals to figure out the depth of that particular area. This device is able to read depths from 2.5 feet to 300 feet. you don’t have to be inside a boat or kayak to use the DT1H! The device is waterproof up to 150 feet so you can take it diving with you if you want to. It even works on the ice so you can use it while ice fishing as well. You can set it up so that the readings will either show up in feet or meters. The DT1H offers up to 1/10 precision. The depth finder uses one 9v battery to power itself so you don’t have to worry about having to wait for it to recharge itself. Since the DT1H is so small, the display screen is similarly quite minimal. This can make it difficult for some to read. The display is backlit, nonetheless, which does make it easier to read. Despite its minute size, the DT1H is more than just a depth finder. You can also use it to discover what the surrounding temperature of both the air and the water. It is even able to show you limited fish readings. The Faria 1380 Chesapeake finder does require a bit of time dedicated to setup. However, it does come equipped with its transom mounted transducer. This means that you can begin installation immediately. The 1380 is capable of detecting distances as far as 199 feet. The advantage of this depth finder is the considerable size of the display. It is large, which allows you to gauge the depth with just one glance. The display is backlit so that it is equally visible during the day or at night. The 1380 comes with an automatic gain control. Therefore, regardless of whether the signal that is being received is too weak or too strong, the result is the same. You will always be able to get up to date readings that are incredibly accurate. You can also set both shallow and deep alarms so that you will be alerted at your desired depths. There is also a keel offset feature available. This way, you can customize settings according to the vessel draft. The only real downside with the 1380 is the depth at which it can work up to. If you tend to head towards deeper waters, you may find that the finder doesn’t function as well as you would like. However, if you like to cruise at medium to high speed on relatively shallow water, then you will find that the finder suits your purposes beautifully. The HawkEye D10DX is an updated version of the previously released D10D. One of the changes that have been made is in regards to the air and water temperature readings. There are integrated sensors in the transducer and the receiver that allows the device to provide accurate readings of the ambient temperatures at all times. The main elements of the D10DX remains its ability to get precise depth readings. This is due to the adaptive software programming that helps to eliminate false readings. You can always be reassured that the depths that are being relayed back to you are up to date and correct. The transducer frequency operates at 200 KHz and is capable of detecting depths between 2.5 and 200 feet. The readings remain consistent even when you are moving at faster speeds. The D10DX is equipped with shallow and deep depth alarms. This helps you to avoid shallow waters that may cause your kayak to get stuck or too-deep waters that may be too rough for your vessel to handle. The alarms are available as both visual and audio alerts. There are a lot of options offered with the D10DX. For instance, you get to choose a transducer that can either be transom mounted or Thru-Hull mounted. Unlike many of the other depth finders, you can also change the bezel, giving you some variation in color. There is a backlight present on the screen display to ensure that the readings can be clearly read even in the face of the brightest glare. As mentioned, it can be difficult to find a depth finder that is a stand-alone product. Therefore, you need to carefully examine the device if you want to avoid paying for features that you don’t really need. Depth finders (or sounders) can typically be separated into two categories. This is the mounted kind and the handheld versions. The mounted depth finders either have to be placed on the hull of the vessel or mounted in some other fashion. This can sometimes mean that you may have to drill holes in the hull. This is done so that the receiver can remain onboard where it is dry while the transducer can be placed in the water. The signal is then collected by the transducer and then relayed to the receiver. The portable depth finders, on the other hand, are ones that you can hold in your hand. In many ways, there have a design and size that is similar to a flashlight. These have transducers built into the devices. Therefore, it is simply a matter of placing the part of the finder that contains the transducer into the water. Portable depth finders are waterproof to a certain extent. This is why they are ideal for diving or snorkelling as they will continue to function if wet. These type of devices also tend to work in icy conditions, making them quite suitable for ice fishing as well. The mounted depth finders use large, 12V batteries to power themselves. This allows them to be functional for longer periods of time. 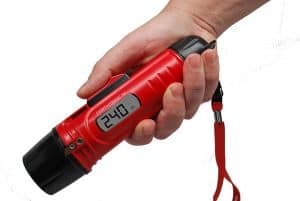 The portable depth finders typically use 9V batteries, which they can change every time the battery dies. It should be noted, nonetheless, that mounted depth finders tend to be a lot more powerful than their portable counterparts. Mounted depth finders are capable of measuring depths up to 600 feet or more. Portable designs, however, can rarely manage over 300 feet. Furthermore, portable options tend to have limited features when compared to the mounted versions. In most instances, the portable depth finders simply only provide depth readings, nothing more. Therefore, to decide whether you should purchase a mounted or portable depth finder, you will need to first look at what your requirements are. Once you have outlined what you need from such a device, you will be able to find the one best suited to you. One of the more important aspects of your depth finder is the display. After all, the main purpose of having such a device with you is to be able to read the numbers on it. This is why you should always opt for a large display that offers up larger readings. This way, you will always be able to quickly read the depth. It is not just size that you will need to be concerned with, however. You should also consider the angle. A screen should be able to be viewed regardless of which angle you are looking at it. Therefore, you should take some time to discern whether you are able to see the readings wherever you are standing. Then, you should make sure that there is a backlight. This is so that you will be able to read the display if the light is very poor. This feature also comes in handy in overly bright situations, when the sun can reflect off the display. As you will see in this list, there are some depth finders that will turn their display lights off every so often. This is so that you will be able to conserve power and prevent the battery from running down. You should know that this is not necessarily a useful feature for everyone, nonetheless. For instance, if your hands are occupied while reading the display, you might find it frustrating to have to keep turning the screen back on. There are several depth finders that are equipped with depth alarms. These are alarms that notify you when you are going into an area that is too shallow or too deep. This can come in handy if you are in a larger vessel where it could be dangerous for you to get too close to the shore. Conversely, it can prevent you from going too far out where the current may be more dangerous. Therefore, these alarms could be quite useful, depending on the situation. There are some depth finders that just do as their name suggest – detect depths. There are others, however, that offer up other options as well. The most common of these are temperature detectors. These well tell you what the temperature is in the water as well as in the air. Some of these devices even have limited fish finding features too. This is what you need to know to purchase the best depth finder for you. The list above is equally as helpful in this endeavor.